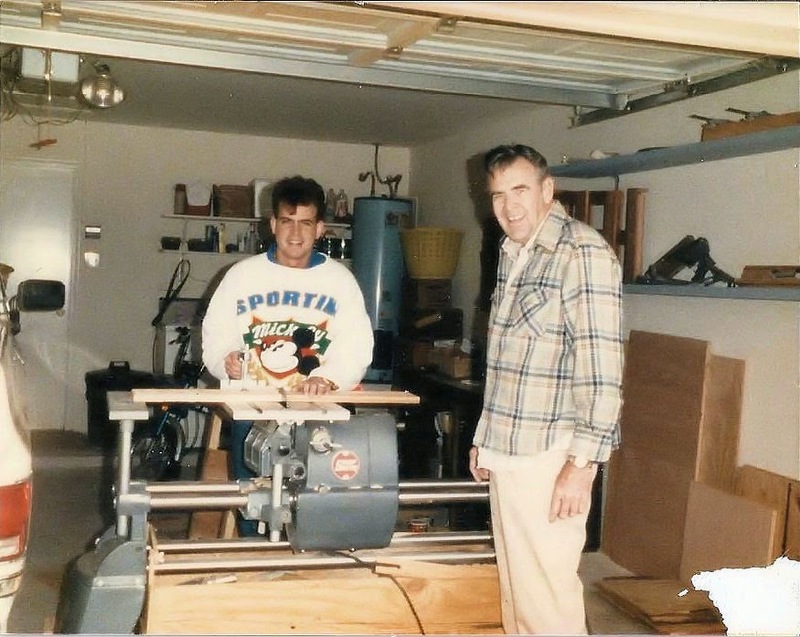 The Gentleman Crafter: Remembering Dad! Today, I sit quietly in reflection of my father. Kenneth Dale Hankins was born in February of 1932 in Rusk County, Texas. He passed away too early in December of 1995 in Austin, Texas. Dad showing me how to use the almighty Shop Smith in their house in Houston, Texas. Dad obtained his Masters from The University of Texas in Engineering. You may have seen me write about growing up with a civil engineer for a dad before....But since it Father's Day...Why not! The man was SMART! Like SMART! And Tall!! Like 6' 3"... You asked dad how something worked and he immediately went for his graph paper and draft pencil for a multi page illustration which usually included a 2 hour speech on the subject...So you learned quickly that if you really wanted to know how something worked you needed to be prepared. Dad was were I got my creativity from. He could build, make and do anything. Now I'm not just saying that...He really could! We were the first ones on the block with solar panels. He read about them, drew them out and built them....I remember a time when there was a furniture store I loved called The Storehouse. They had the most awesome bed ever. They had a catalog that pictured the oh so modern bed so, I gave him the picture and two weeks later...I had the exact same bed! He was really amazing. What I remember most about dad was that he never stopped. From getting us up in the morning, to going to work, to coming home and working tirelessly on fixing cars, mowing the grass, building things, jewelry making, (Yes, he was an avid rock hound and made gorgeous sterling silver jewelry) to being plumb tuckered out and still sitting in his chair, polishing shoes or cracking pecans from the pecan trees out back. I would wake up in the middle of the night like at 1 or 2:00 a.m. and the light was on in the living room where he could be found totally into his Louis L'Amour western novels. He loved them and collected them all. He would try anything...From making something he had no idea how to make, but would try... to trying out new family fitness techniques with his family....There were times when he would be on these fitness jaunts...He would get the whole family up at the crack before school and have us exercising with these spring things you had to pull. You would put one end under your foot and the other end in you hand and stretch! Thinking back...how crazy a scene with my sisters, Mom, Dad and I all pulling on spring things at the crack in the living room! Laughing a bit, but still remembering how much I hated it! LOL! Dad loved the outdoors and loved camping. By the time I was 16 years old we had pretty much seen each and every State Park in the USA!! Those were probably my most cherished memories. I loved camping and still do! He always made it so much fun! Those memories are the ones that make me ache with regret that they are gone and so long for more. My whole family together enjoying each others company... taking hikes, eating around a campfire and enjoying the majestic scenery of the Grand Canyon while Mom and Dad held on to the belt loops on my blue jeans so that I could just see to the bottom of the canyon! Today, I think of the many things he taught me...The reassuring way he told me that when I ran, I needed to hold my hands and arms to my side and not flail them about wildly like a girl. LOL! Or, how to roll up a utility cord so it wouldn't tangle up, how to change my oil...the brakes on my car, how to build things, refinish things...fix things...So many lessons learned....The most meaningful life lessons....Always be a good Christian Gentleman, give to others, and TRY ANYTHING WORTH TRYING! I love you Dad! Thank you for giving so much of yourself and teaching us what's important in life! Love on your Dad today! Happy Father's Day! Sounds like you had a great Dad Jim. Continue to enjoy your memories. Take care & God bless! Beautiful tribute that brought a lump to my throat. e sounds and looks like a lovely man to have known... You did him proud..
What great memories to have of you dad. He is kind of like my dad. One day I was telling him about maybe buying a lightbox. To be able to take pictures of my grandmother's old negatives. Then an hour later he came knocking on my door. With a homemade lightbox for me. I totally wasn't expecting him to make me one. But he did. It works well then anything you buy at the store. What a nice tribute to your father! I'm glad you inherited his creative mind....and share it with the world! I loved this Jim! Reminds me so of much of my Father. Who was that good looking young Man in the photo? ! What a wonderful tribute. I love to think of the things I learned from those who went before and we honor them as we continue their legacy. Beautiful. What a beautiful tribute to your dad. I lost my dad in 2000 and I usually try to ignore Father's Day cause it makes me sad. This is a much better way of handling it. I am sure your Dad is looking down and you with pride and love. What beautiful memories you have of a wonderful Dad!!!! Thanks for sharing them!,! I would have liked to have grown up with your Dad after reading that really vibrant account of how special he was. You certainly have inherited some of his crafty, can-do ways! What a beautiful tribute you wrote to your Father. What a wonderful Father you had. Treasure your memories always. I know you've seen this comment before...but... what an AWESOME tribute to your dad. I could just "feel" the love you guys had for each other! Thank you for sharing a few of your wonderful memories with us. Now I have a better understanding of how you are able to create such amazing things. I'm sure you dad is really proud of you! what a lovely story. Your Dad was smart and resourceful. In contrast, my Dad was all over the house never really finishing a project. Looking back, all those crazy projects make laugh now... As other fans had said it, those memories warm our hearts in rainy days. Thanks for sharing.